In this post, we take a look at Digital Toys series of apps. It includes 6 apps, Robots Factory, Everything Machine, The Monsters, Infinite Arcade, Me and The Creature Garden. You can get them all in the Tinybop Makers bundle (which works out cheaper than purchasing the apps individually). My 6 year old helped me review these apps and we’ll take a look at each one individually sharing our experience with the app. My son (dinocat) has rated the apps from his favourite (#1) to least favourite (#6) based on what he's currently interested in. 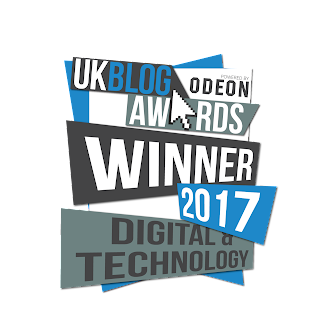 They are all fantastic and provide children from age 4+ a platform for open-ended discovery and learning. My favourites are 'Me' and 'Creature Garden'. Like every other Tinybop app, each comes with a technical manual to provide some guidance on how to use the apps. The manuals are useful for parents to read and talk about with their child, but I’ve found my son just wants to dive into the app to explore and learn as he plays. In my opinion, this is the best way to explore the Digital Toys series of apps. You will definitely NOT be disappointed with the amount of content that is available. The graphics and playability of the Tinybop apps are fantastic. If you have more than one child and only one device (this has always been the case in our family), you can create a profile for each child. It’s a really useful feature as you wouldn’t want a sibling to change, or worse, delete a game you’ve spent hours building. I’ve even created a profile for myself on the 'Everything Machine' as I’m currently learning how electronics components work. Yep, adults can play too! So let’s look at each app and discover what you can expect. 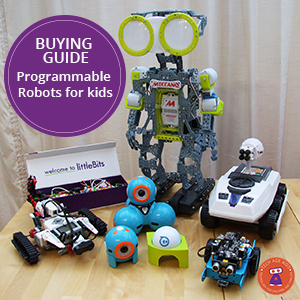 Here you can build your own robot and play with it in a game and see how it performs. When it gets damaged, bits of your robot falls off. Back in the factory, you can improve your design and then test it again. You can save your project and modify it later when you get more ideas. All your creations are stored in a gallery of robots. Read our full review of the Robots Factory. Download Robot Factory from iTunes. This app is a type of drag-and-drop programming language that allows you to make machines with electronics components. You start with a battery to power your machine and then you can add inputs, controls, detectors, modifiers, routers, logic gates, and outputs. The technical manual is somewhat useful here to figure out what all the parts are, but you'll get the most value from experimental play. The manual contains 4 sample machines which you can program. There's also 5 getting started programs, with video instructions to give you an idea of how it works. 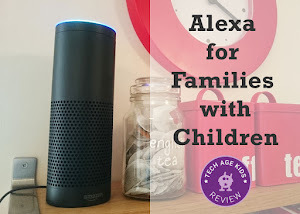 The Everything Machine provides a fantastic opportunity for children to explore electronics components without actually having to work with the real components. 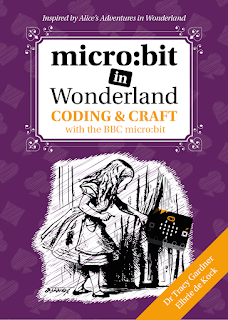 Children will also learn basic coding concepts using logic gates. There's a download button on each project which allows you to email your creation to Tinybop. You’ll need to enter a date of birth to do this. Download The Everything Machine from iTunes. 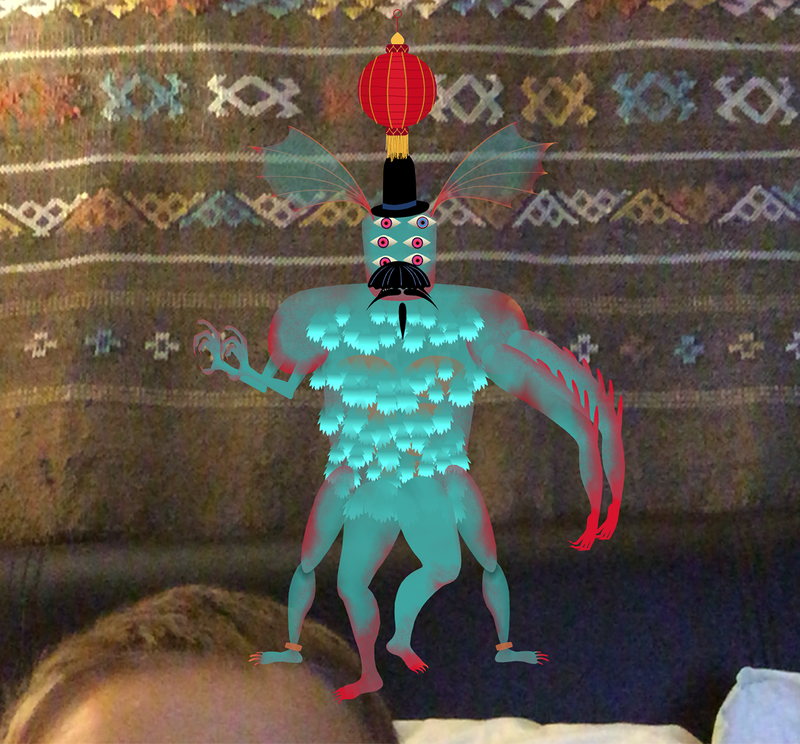 My son is a little afraid of the dark and monsters, but he liked this app where he would create his own monsters and place them in a gallery of monsters. It’s quite a fun experience building your monster. You choose a shadow outline and then add limbs, a head, and tail. You can then completely customise your monster and add 5 emotions for the monster. It can be happy, sad, angry, lovable, and more. In the gallery view, there’s food which you can use to feed your monsters and if you don’t like a monster you can drag it into a bin. When you drag your monster into a photo booth and you can take a selfie with it or take a photo of the room you're sitting in with a monster in it. You can also add photo booth accessories for you and your monster. My son loved this app. Download The Monsters from iTunes. This app is an arcade game with a twist. You make your own game and play it. There are 4 different types of arcade games to choose from - a pinball, ball and paddle, platform or maze game. You then build the game and decide how to win the game and how you will lose. There's a selection of characters or balls (depending on the type of game your chose). Once you’re happy with your game you can save it and email a link to Tinybop to add it to the Hall of Games. You can also play other people’s games and make a copy of it to modify and add to your own games. If your child likes playing games, this is a fantastic app to help then learn the skill of making the games too. My son loves this app and it’s his favourite of the digital toys series. He really likes playing Ninja Trails by Tinybop as you need to complete different challenges and it takes some skill. He's been practicing! Read our other review of the The Infinity Arcade. There are other apps like CodeSpark Academy and Bloxels to which encourage you to build and then play your own arcade/platform games. 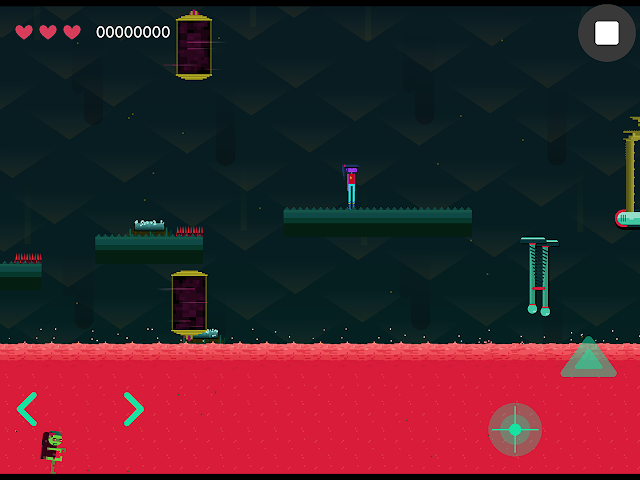 Download The Infinite Arcade from iTunes. This app works like a personal digital journal that uses prompts to help your child record certain information about themselves. Sometimes they need to type something, other times record a voice message. They can also draw, take photos and videos to add to the app. It covers all sorts of topics from your family tree, things you do at school or home to different emotions, your likes and dislikes. 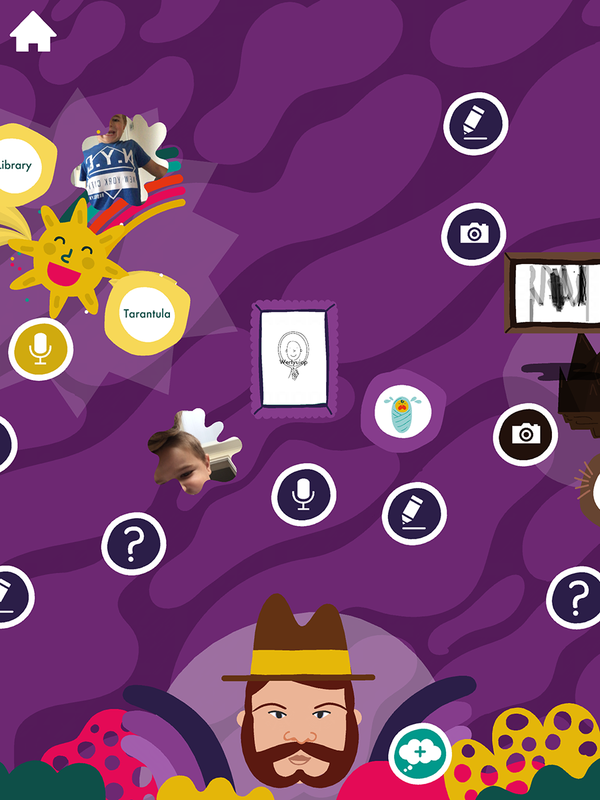 Tapping ‘you’ in the app produces random questions for your child to answer. You can also customise your character to look more like you. I like that I can tell it about things about my life! In Creature Garden you create a fantastical world with land, flying and water creatures. You start by hatching an egg and then you can design your animal! My son made some of his animals look exactly like the real one - 'Look mummy I made an elephant! Are his back legs the right size?' and others were just whimsical and crazy! 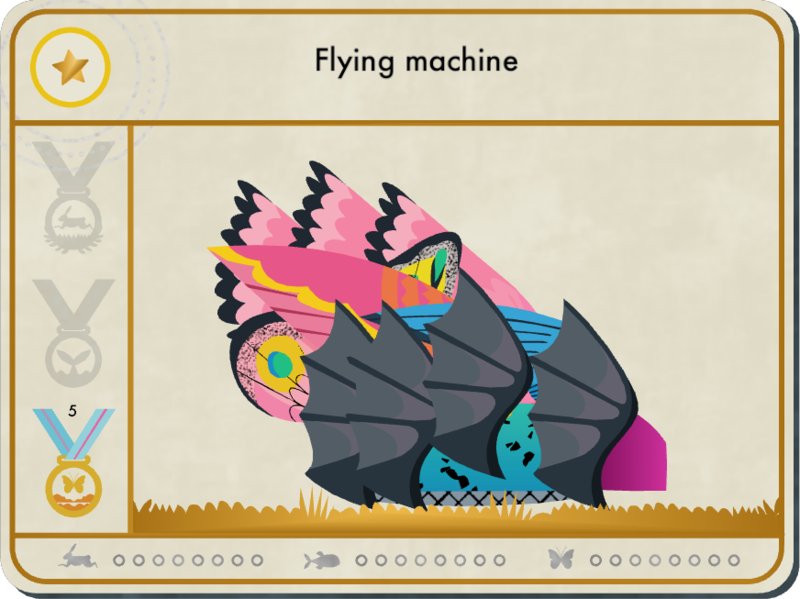 As you design the animal you can test it, a bit like in the Robots Factory app. See if your animal performs best on land, in the water or in the air. Once your animals are in their habitat, you can feed them, make new babies and race them against each other. My son loved this feature the most. He would try design animals that would perform really well in the races. You can also influence the races with tornadoes, balloons, waves and more. There's so much to explore in this app. We're currently fighting who's turn it is to make a new beast! Here's a picture of my son's flying creature, complete with every wing in the set. Let's just say it wins every flying race, even if you place a few tornadoes in front of it. Download Creature Garden from iTunes. 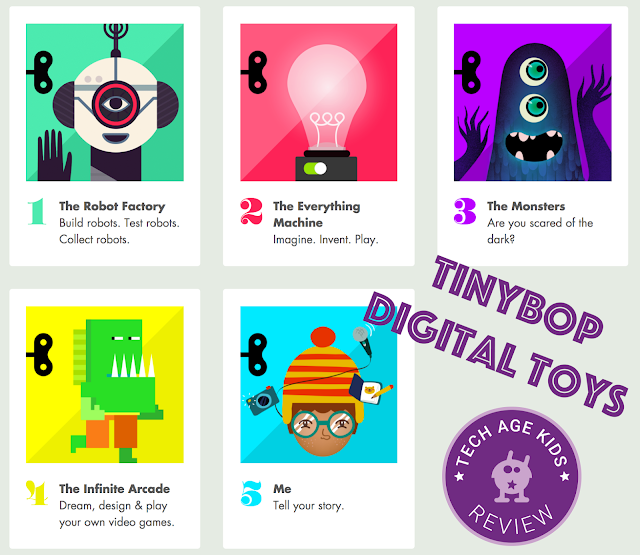 The Tinybop Digital Toys Makers bundle is a great investment and you and your child will gain hours of enjoyment. They are not just entertainment apps, you're going to learn lots of new skills. Tinybop has a high design standard and every app is unique. At first, it may seem expensive, especially if there are so many free apps available. However, with Tinybop apps you get peace of mind that your child isn't going to click on an annoying ad and they are going to be engaged in a creative digital activity. If you have young kids you probably should own at least one Tinybop app! The apps are available for Apple devices. BUY: You can purchase the apps individually from the iTunes Store: Robot Factory | The Everything Machine | The Monsters | The Infinite Arcade | Me | CThe Creature Garden or get the Tinybop Makers Bundle for $11.99.